3 for Intelligence: How about a shiny new colossal? 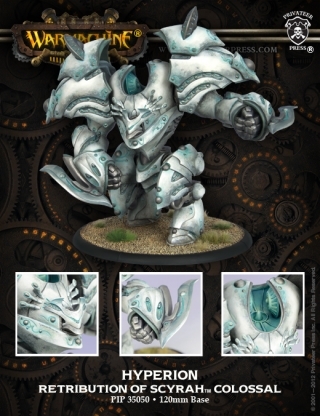 Privateer press is jamming out new stuff left and right with the release of the new colossals book! How about a retribution colossal? "Hyperions tower over the vanguard of Retribution forces, armed with an incomprehensibly powerful starburst weapon capable of annihilating anything in its blast. Originally designed centuries ago to protect Ios from the unspeakable threat of dragons, the power Hyperions wield is so terrible they were banned from Iosan cities and relegated to deployment along its borders. Incissar Vyros, emboldened by victory, has now overridden that order to add these most formidable Iosan constructs ever developed to the Retribution’s arsenal." Here's another Dwarf Warcaster! Just what Soldado has been looking for! 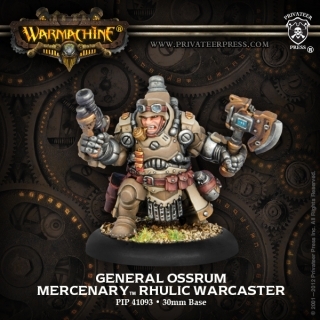 "General Ossrum Dhurg’s disdain for traditional tactics and penchant for startling improvisation and bold maneuvers have earned him both admiration and ire from his peers. The men he commands, though, regard him with universal respect and affection, not merely for the victories he brings their clans but also because he asks nothing of them he would not do himself. Always on the advance, General Ossrum greets each morning with fresh enthusiasm, intending that should the day be his last, it will end in glory." The mercs and minions don't have too much in the way of stuff, so it's good to see them get more. It's disheartening to play a faction and just not have the options available to compete!